Travel to Argentina is travel to the capital of tango and steak. This Latin American country is characterised by music, dance, its gastronomy and the nature that surrounds it. Argentina is also known for the long distance from one end of the country to the other, spanning from the Iguazu Falls, which border Brazil, to Patagonia, where you will find natural wonders such as the Perito Moreno glacier. Its capital, Buenos Aires, is a city full of life where we find the colourful street of Caminito, the most typical street of the city in the La Boca district, and home of the famous Boca Juniors, considered one of the five football legends of the country. Travellers who go in package holidays to Argentina can also explore its literary legends, amongst them authors such as Quino, where there is a life-sized statue of his famous character, Mafalda, seated in the neighbourhood of San Telmo. Don’t overlook the chance to visit, the Cabildo museum, take a stroll down the Avenida de Mayo or take a seat in the Café Tortoni, historically frequented by intellectuals. No visa is required to enter the country. Depending on the area of the country that you plan to visit, vaccinations against yellow fever may be mandatory. Consult the Department of Health. All the comments below belong to people who have travelled to Argentina with Exoticca in the past 18 months. The wonderful aspects of nature that we saw on the trip were spectacular and left us with plenty of poignant memories. 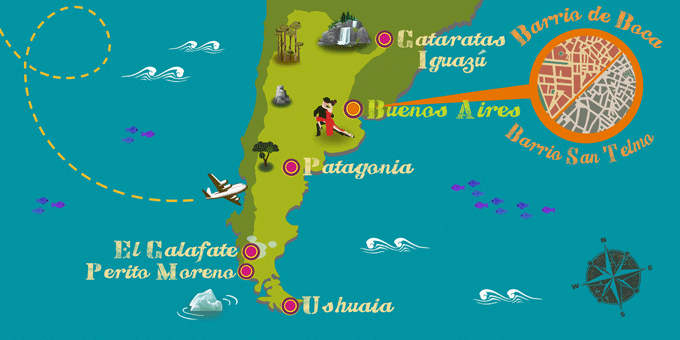 If Argentina has caught your attention, leave us your number so we can call you to discuss the voyage that awaits you.